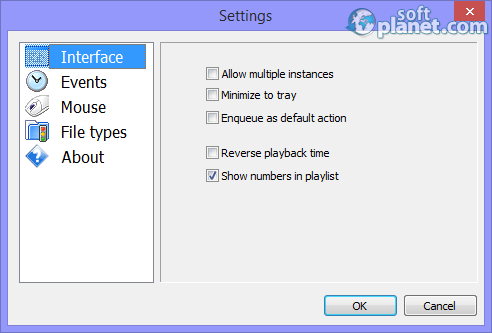 SoftPlanet makes it possible for everyone to get free Axara Free FLV Video Player download directly from our servers. There is no registration needed for downloading. Axara Free FLV Video Player 2.4.7.24 is a multi-format audio and video player which is compatible not only with FLV files, but also with AVI, ASF, M4V, MPEG, SWF, MP3, AAC, OGG, etc. The player is a free application, it can be downloaded many times to many computers and does not have any requirements about a registration or a subscription. It it a perfect solution and an excellent replacement of your current media player. Axara Free FLV Video Player has English, German, Spanish, French, Italian and Russian user interfaces. Besides the association with many file types this program can have multiple instances, which means that you can open the application on your screen more than one time. It also has a playlist panel with its own options, configurable left, double-left, middle and right mouse buttons and events when you start the program or load a file. The interface of Axara Free FLV Video Player reminds us a lot about Microsoft Windows Media Player. Of course Axara's program has fewer features and options but this can not be a reason to deny using it. By default you can pause and resume the playback with a single left mouse click. This action can also be configured to mute the sound or do nothing. For all the available controls and to get to the program settings this program uses its context menu only. Axara Free FLV Video Player can stay always on top of the other windows; it can be stretched to full screen and the playlist can be hidden. Users can activate shuffle and repeat control features but they are the only ones which this player has. Axara Free FLV Video Player 2.4.7.24 is a 100% free player which can play videos from YouTube, Facebook, Yahoo, etc. The fact that its interface is so simple in some cases can turn this disadvantage from a minus to a plus. We strongly recommend this multi-format media player to any user who is looking for a decent player with built-in codecs. Axara Free FLV Video Player is VIRUS-FREE! Our security scan shows that Axara Free FLV Video Player is clean from viruses. The current version of Axara Free FLV Video Player has been scanned by our system, which contains 46 different anti-virus algorithms. That ensures that Axara Free FLV Video Player 2.4.7.24 is 100% safe for your computer.